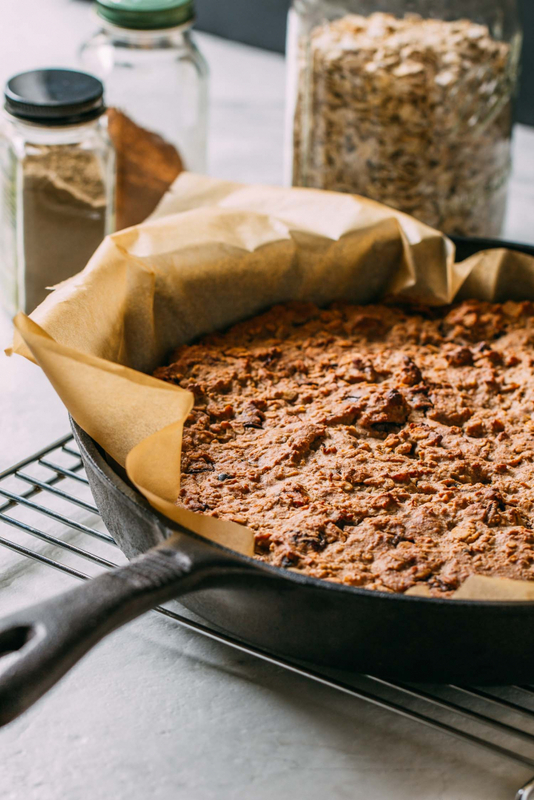 Ever since devouring our very first batch of Vegan Baked Chocolate Chip Skillet Scones, we are skillet scone fans! 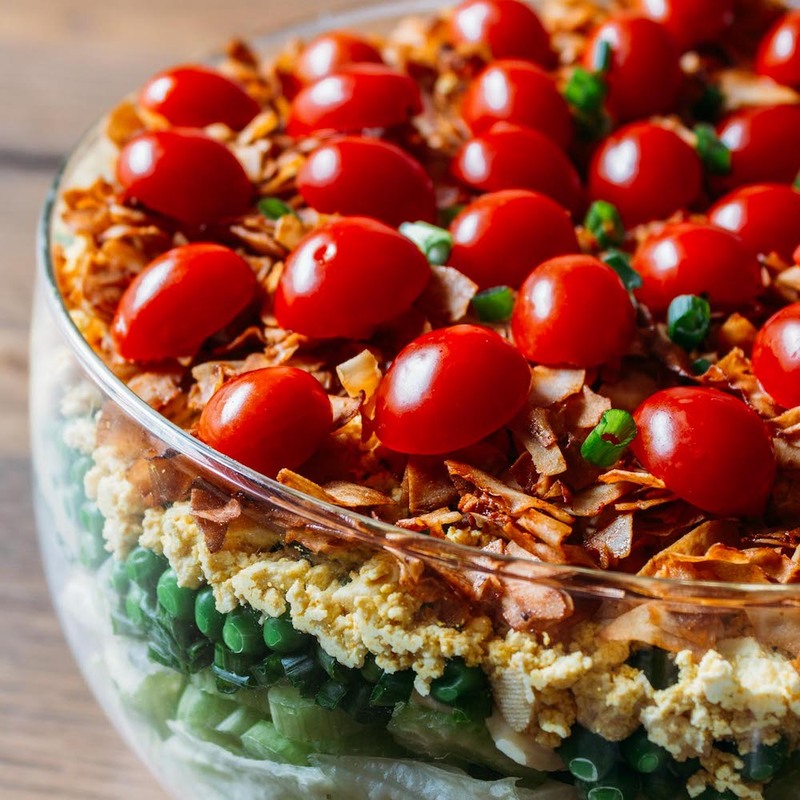 Need to bring something to share at a potluck, picnic or get-together? Make these scones. Want to bake something special on the weekend to show somebody how special they are to you? Bake these scones. Want to feel like the most fabulous baker in the whole-wide-world? Also, don’t really want to fuss all that much? 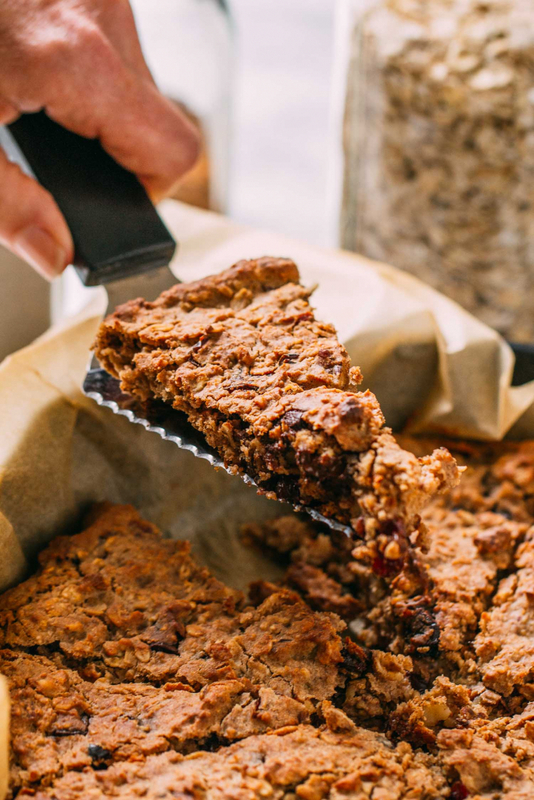 Bake these Vegan Baked Chocolate Chip Skillet Scones! That’s funny, writing the phrase whole-wide-world feels very child-like. That feeling fits the mood of these scones like a glove. This recipe is childlike in that it’s full of delicious dates, berries, chocolate chips, and other wonderful goodies. 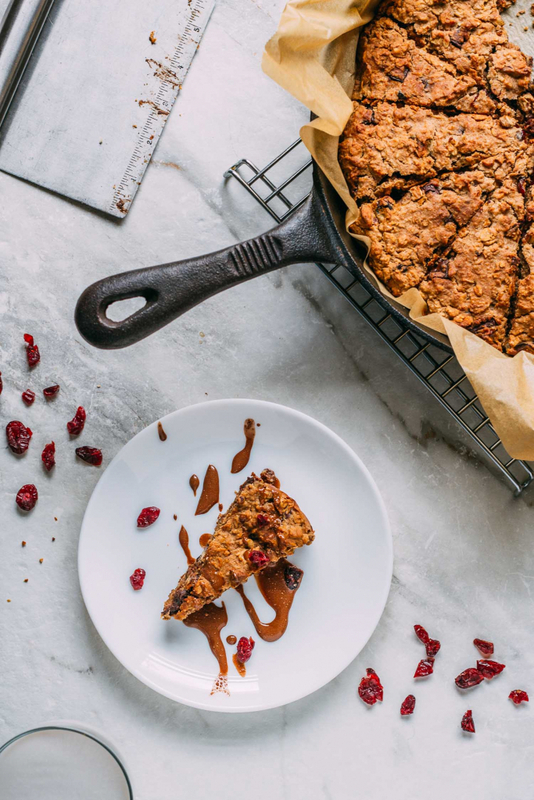 Each and every bite of mouth-watering Vegan Baked Chocolate Chip Skillet Scones delivers yet another sweet surprise. Speaking of surprises, chickpeas is undoubtedly a jaw-dropper kind of ingredient to include in a batch of scones. And when you include the aquafaba, the technical term for the liquid or broth from a can of chickpeas; mind-blowing! Imagine that; for years we dumped broth down the drain. A few recipes ago we found that aquafaba could put the CHEWY into our Chewy Chocolate Chip Oatmeal Cookies. Since we bake gluten-free, it seems we may have possibly adjusted expectations about how things would turn out. But thanks to the experience of baking countless test batches of gluten-free chocolate chip cookies, we can tell you that chewy, flaky, fluffy and all sorts of other tasty adjectives are ours once again. Don’t misunderstand, the aquafaba isn’t a miracle on its own. If you snag a taste of that stuff straight out of the can anticipating something even remotely appealing, well, you’ll be left hanging. But when aquafaba combines with ingredients like cream of tartar and lemon juice, well, suddenly aquafaba becomes a rockstar! In a matter of just a few seconds, the aquafaba does its thing with the other ingredients making everything lighter, fluffier, and moist without adding fat. Hello! Now, that’s a deal maker in our book. Speaking of deals – on a side note, once again one of our favorite old measuring spoons found it’s way into our garbage disposal and, so we’re looking for a new favorite. These look durable and easy to read, so, we’re giving this set a go. And we’ll be sure to give each little spoon the heads up to be careful near that slippery sink! 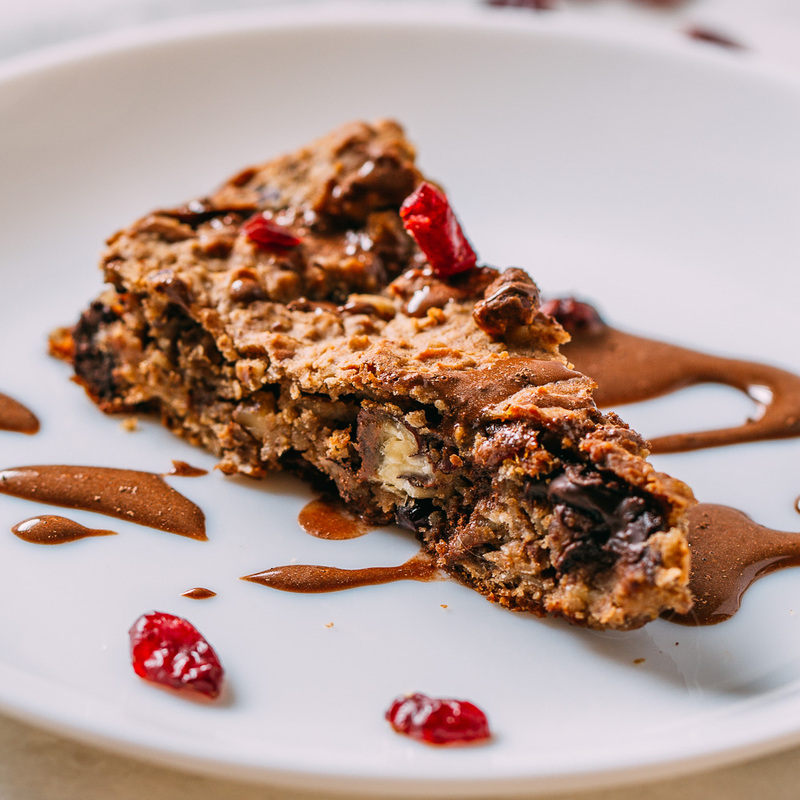 Thanks to the inclusion of aquafaba in our Vegan Baked Chocolate Chip Skillet Scones, we arrived at a chewy, flaky, fluffy and moist dessert or breakfast pastry that is gluten-free, plant-based, oil-free, refined sugar-free and vegan. When you try this recipe leave a comment here on the site to let us know how well it worked for you. 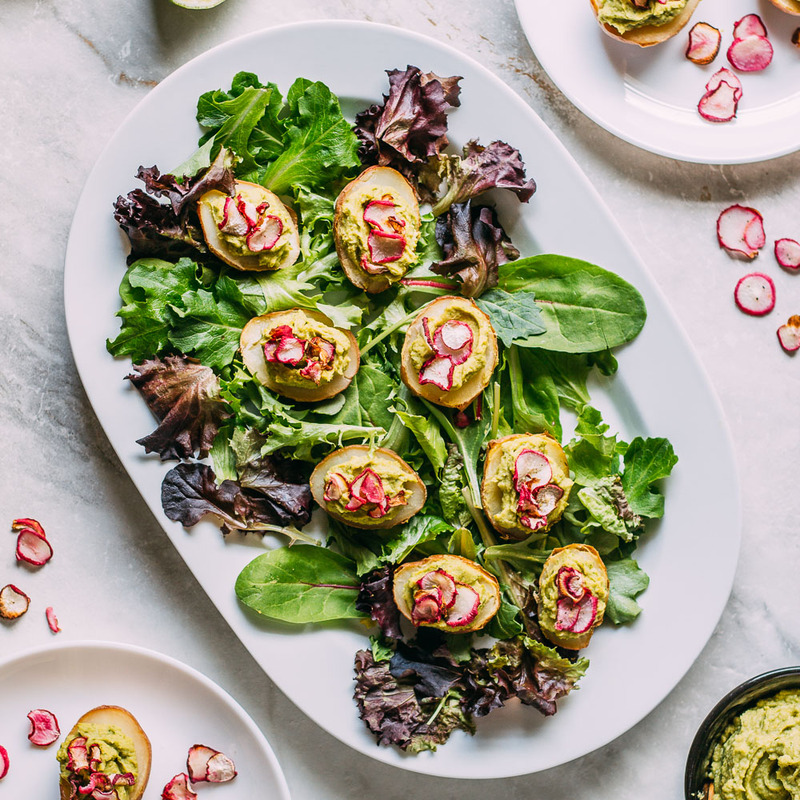 By the way, your comments make other people give our dishes a go and help spread the good word about the lifestyle choice of enjoying healthier, plant-based and cruelty-free recipes! 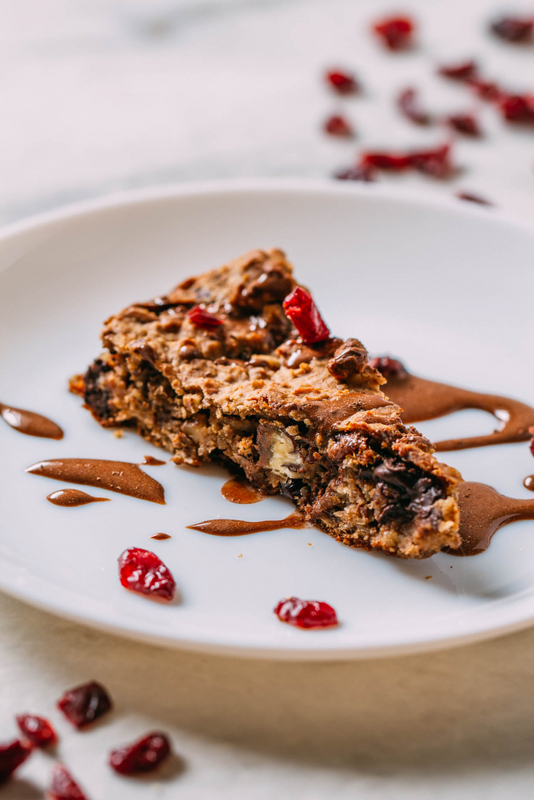 It’s not often that you come across descriptive words like chewy, flaky, fluffy and moist in recipes for gluten-free and plant-based baking, but this recipe for Vegan Baked Chocolate Chip Skillet Scones is about to change that for good! We call these scones since they’re slightly sweet without being decadently sugary, making these a perfect bite to enjoy for breakfast or afternoon tea. Chickpeas and their broth (aquafaba) are incorporated to create a delicious scone that is both hearty and delicate, at the very same time. And once you taste these scones, we guarantee you will want to try some of our other goodies! We’ve made quite a few dishes made with this surprisingly useful cooking broth! You’re sure to love our Chewy Chocolate Chip Oatmeal Chocolate Cookies – they get both their tender inside and crispy exterior from aquafaba. And our 1-Bowl Crazy-Healthy Black Bean Brownies with Pistachios are super moist, thanks once again, to the aquafaba! 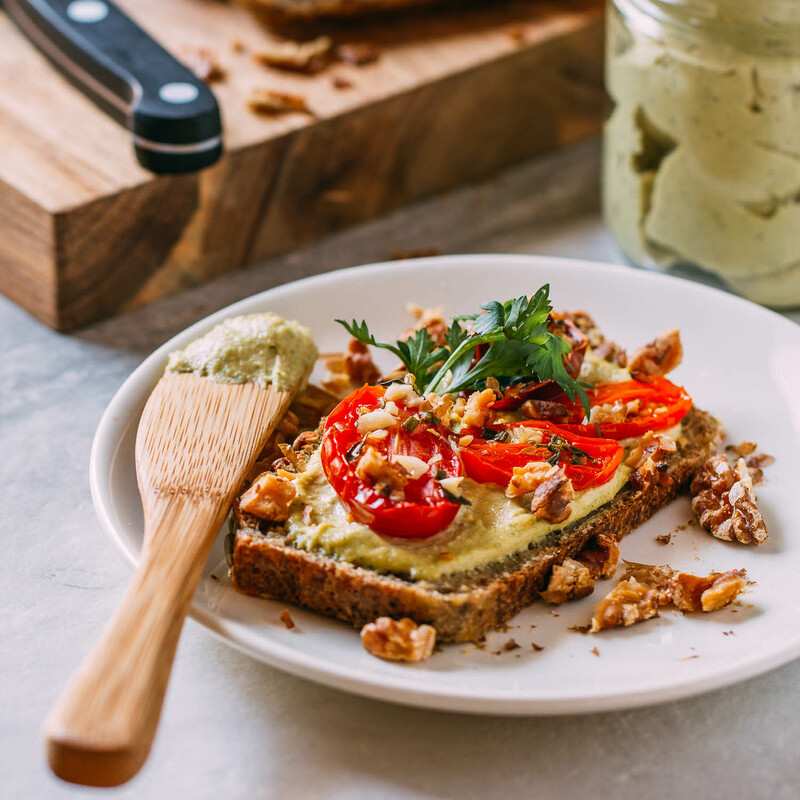 On the savory side, we use aquafaba in our recipe for delicious Heart Healthy 5-Minute Oil-Free Hummus, too! This recipe makes a generous batch of scones. From our 12-inch round skillet, we sliced 16 significantly-sized serving. Adjust the cooking time according to the pan size and depth. 1 tbsp of freshly ground flaxseeds or flaxseed meal - We prefer to use a grinder to grind our own fresh flaxseeds in order to gain the most nutrients. 1 cup of oat flour - Easily grind oats into oat flour using a food processor. 1 cup of old-fashioned oats - By the way, we use organic certified gluten-free oats to ensure that we will end up with a gluten-free scone! 1/2 cup of cacao nibs or vegan semi-sweet chocolate chunks or chips - We often use the "Enjoy Life" brand of vegan chocolate chips for baking. Preheat the oven to 400º Fahrenheit and put an ovenproof iron skillet in the oven to preheat as well. 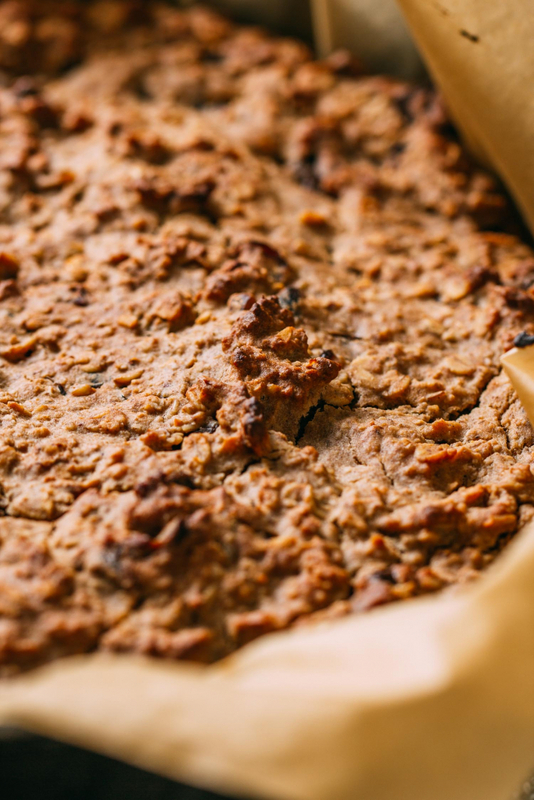 If using or another oven-safe baking pan there is no need to preheat the pan. Once you're ready to bake, remove the skillet from the oven and line the iron skillet with parchment paper. To begin, in a food processor or high-speed blender, combine the first eleven ingredients, which are the wet ingredients including the little dash of cream of tartar. Blend these wet ingredients until smooth. Taste and adjust salt and spices as needed and set aside. We used a high-speed blender to combine the wet ingredients. We bought a refurbished Vitamix about five years ago. For five years and then some, we use it multiple times a day. Next, in a large mixing bowl, add the dry ingredients, stirring to distribute evenly. Using a spoon, gently stir in the blended wet ingredients into the dry ingredients along with any optional add-ins. Remove the preheated iron skillet from the oven and line with parchment paper and fill with the batter. And if using another baking pan line it with parchment and fill, too. Gently press the cookie dough to fit the pan. There's no need to push too hard, but do squish the dough down a bit to fill most of the baking dish. Another option would be to bake this on a sheet pan. We used an iron skillet because we know it helps create a crispy bottom. Bake your tasty skillet scones for about 30 minutes or until very lightly browned. We moved ours to the top rack in the oven for an additional 5 minutes of bake time, but it's not required. But do be sure to allow your skillet scone to cool a few minutes before carefully lifting out of the pan to finish cooling on a cooling rack. Slice into preferred shapes and transfer and store in an airtight container. 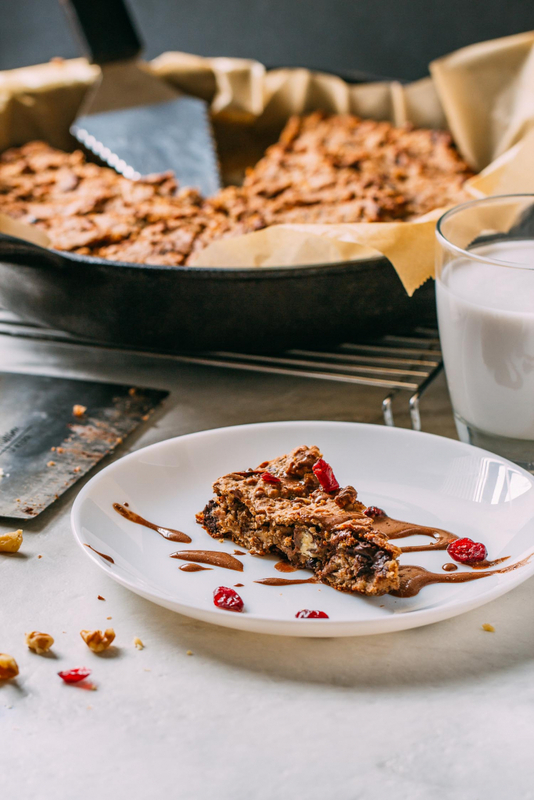 Enjoy your skillet cookie with a tall glass of your favorite plant-based milk while you feel good about indulging in a sweet treat of healthy homemade goodness. We sliced ours into serving sized pieces using a pastry cutter as soon as we removed it from the skillet. Homemade skillet scones taste terrific alongside a strong cup of coffee or tea... just sayin'. If gluten is of concern, be sure to use oatmeal identified as gluten-free. As mentioned in the ingredients list you can quickly grind oats into oat flour using a food processor. Here's a decent price if you prefer to purchase organic Medjool dates in bulk. Wow, I’m not even a gluten-avoider, but these sound fantastic. Might be whipping up a batch later today. Great to hear you’re giving some serious thought to trying this recipe, GCee! It would be wonderful to hear how your batch turns out, and thank you for sharing how this recipe caught your interest. Any suggestions for modification if not using canned beans? I usually cook my own beans in a big batch from dry. Great question, Melissa, so thank you for asking. And wow, do homecooked beans ever have a pleasant taste advantage over canned or what? If you have a batch of chickpeas already cooked, a typical storebought can is about 14 to 15 oz total, (so close to 2 cups) with about 9 ounces or 1 1/2 cups of that being beans and the rest liquid. As long as your homecooked beans are plain, without added garlic or other seasonings, measuring like this should be pretty much an even trade. You want that bean liquid in this recipe, but a little more or fewer beans or their broth will not likely cause a huge difference. I’d love to hear how it goes for you! So, 1 1/2 cup beans and enough liquid with it to equal just under 2 cups is my attempt at this bean math. I am a born-tweaker…. yep, that’s a confession. Since we don’t need to eat gluten free, I subbed 1 cup of whole wheat flour for the oat flour. And I left out the cinnamon & cardamom. But, despite my tweaking, these are awesome! We liked them a lot. Something so healthy shouldn’t taste so naughty. Great way to camouflage some beans, etc. for picky eaters. Add some chocolate chips, and they’ll have no idea they just ate oats & beans. So glad to have a born baker visiting this recipe and loving it, JoAnn! And thank you for sharing your appreciation and tweaks that are always so helpful to us recipe readers. We adore the cardamom and cinnamon in these scones, but so very happy you made some changes to make this recipe your own! Stay with us as there are more delicious and healthier baked treats to come! Thank you for sharing your recipes and suggestions. We were taught from our mother to heat our cast iron skillets in the over for the crusty bottoms. We heat oil in it when make biscuits. The bottoms are to die for. And Momma knows best – especially when it comes to tips and tricks shared by a Mom who cooks, that’s for sure, Betty! I miss my Mom so much, but since I learned so much from her, in some ways, it’s as though she’s always with me. And thanks to that preheated pan, her cornbread and biscuits had the best bottoms around! Thank you for reading this recipe, and I hope you’ll stay in touch.